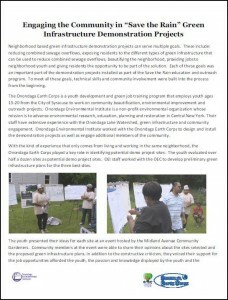 Onondaga Environmental Institute (OEI) worked with the Onondaga Earth Corps (OEC) to design and install the demonstration projects as well as engage additional members of the community. With the kind of experience that only comes from living and working in the same neighborhood, the Onondaga Earth Corps played a key role in identifying potential demo project sites. The youth evaluated over half a dozen sites as potential demo project sites. OEI staff worked with the OEC to develop preliminary green infrastructure plans for the best sites. The Bishop Foery Center is a community center operated by Catholic Charities that serves youth in the neighborhood around Newell Street on the Southside of Syracuse. The green infrastructure plan for the Bishop Foery Center included the addition of gutters to the front of the building, four rain barrels and two linked rain gardens. Stormwater that previously flowed off the roof, down the path and into the storm drain in the street now flows into the rain barrels and rain gardens. Water from the roof of the Bishop Foery Center flows from the gutter into the rain barrels. 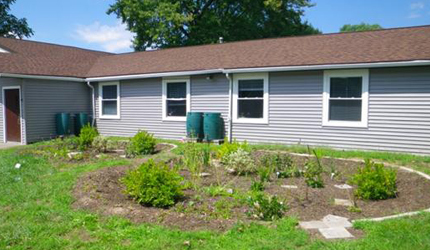 When the rain barrels are full they overflow into the rain gardens.